Order designer personal checks online featuring a wide variety of styles that spread awareness and show your support for social and environmental causes. Most styles are available in your choice of single or duplicate checks. 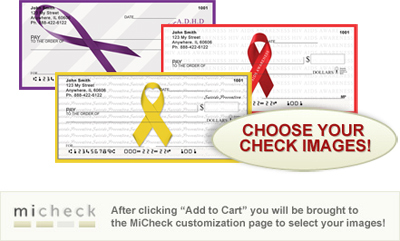 Checkbook covers are also available to match most of the awareness check styles offered. Order personal checks that help put Autism in check. Raise awareness when you use this unique selection in your daily routine. Choose your own images from a collection containing support ribbons for various illnesses and causes. The healing power of laughter is undeniable, and save the ta-tas Foundation embraces that belief as a core part of the organization's commitment to fighting cancer. Share in that commitment with your purchase of save the ta-tas personal checks, address labels, contact card and checkbook cover. Show your support for Down Syndrome Awareness with these bold and unique personal checks that display the signature ribbon for this worthwhile cause. Spread Awareness with these bold and unique personal checks that display the signature ribbon for this worthwhile cause. © 2013 Checkspressions ~ Order Awareness personal checks online.